Communication technologies surround us in every part of our lives: via television, web, blogging, mass media, and much more. How do people in business keep up with the latest and greatest trends, and how do they differentiate good information from bad information? How do they get help analyzing information and coming to conclusions about trends that will impact their businesses and business decisions? How do they consider the environmental and sustainability issues surrounding communication technology? This book answers these essential questions. It's for professionals and students working in telecommunications, including electronic mass media, digital signage, computers, consumer electronics, games, satellites, and telepresence. The best of the best minds on these topics all come forward here, each in their own chapter, to report on, analyze, and make recommendations, for the new edition of this definitive guide to new technologies.
. New chapters on digital cinema, mobile commerce, digital television, cinema technologies, e-books, home video, digital audio, and telepresence.
. Website - brand new for this edition. 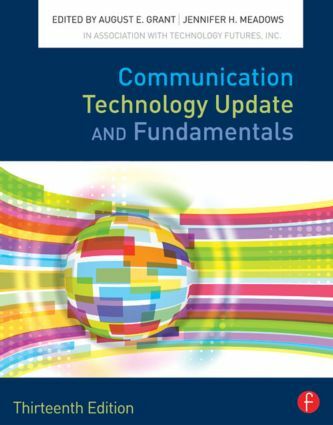 Chapter-by-chapter additional coverage of technologies and further resources. Continually updated.